The Reverend Jason Edward Bedel grew up on Cheviot, Ohio near the Western side of Cincinnati. He is the second of seven children of James and Mary Beth Bedel. He is a 1995 graduate of Xavier University where he received a bachelor’s degree in Public Relations. Fr. Bedel worked for The Home City Ice Company for 10 years. In August of 2002 he entered Mt. St. Mary’s Seminary of the West in Cincinnati to begin studies for the priesthood. He was ordained a priest in May of 2008 and received a Master of Divinity degree. 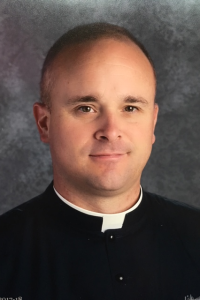 His first assignment was as parochial vicar at the Church of the Holy Angels in Sidney, and teaching at Lehman Catholic High School. Beginning in 2011, his Second assignment was full-time faculty of Bishop Fenwick High School with Sunday Masses at St. Mary in Franklin. In 2014, Archbishop Schnurr named Fr. Bedel the pastor of Holy Trinity in West Union, and St. Mary Queen of Heaven in Peebles. That same year, Fr. Bedel completed a Master of Theology Degree from the Athenaeum of Ohio. In 2017, Archbishop Schnurr named Fr. Bedel the pastor of St. Margaret of York, Twenty Mile Stand.